Belden has added new Gigabit Ethernet connectors to its Lumberg Automation product range. These connectors, which support data rates of up to 10Gbps, have a compact design with special shielding that also covers the individual wire pairs, thus guaranteeing reliable data transmission even where there are strong electromagnetic fields. 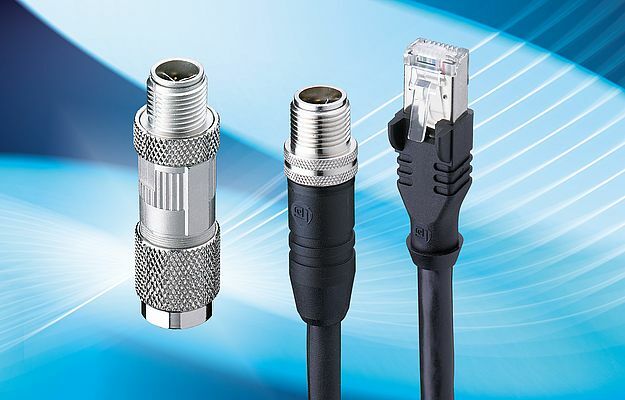 They are offered with M12 or RJ45 connection technology, and in both molded and self-assembly versions, optionally including individual cable lengths, making them flexible and quick to put into operation. Other features include a robust design, a wide operating temperature range of from 30° to +90°C and - for the M12 versions - industrial protection class IP67. The Gigabit Ethernet connectors thus facilitate highly available and cost-effective solutions for a host of applications, such as connecting IP cameras and infotainment systems in rail vehicles - approval under EN 50155 has been applied for - or wiring up complex machines and systems. The self-assembly M12 versions, with eight-pole connectors and couplings with x-coding and screw connectors, have a threaded joint. Cables are made up either using cut and clamp or - for the flanged versions - via print contacts. The molded M12 connectors also have eight-pole x-coding and, like the corresponding RJ45 versions, are available with made-up cables on one or both ends. A version with an M12 and an RJ45 connector is also available.